I believe this is the deepest snow I’ve seen since the Northeast US Blizzard of 1978, and thoroughly deserving of some tightly-focused verbal energy from Malcolm Tucker, I think. But, I’m right in the middle of the worst band of the – cue trumpets – Blizzard of 2015, so at 2:30 in the afternoon, still the snow comes down at a good clip. 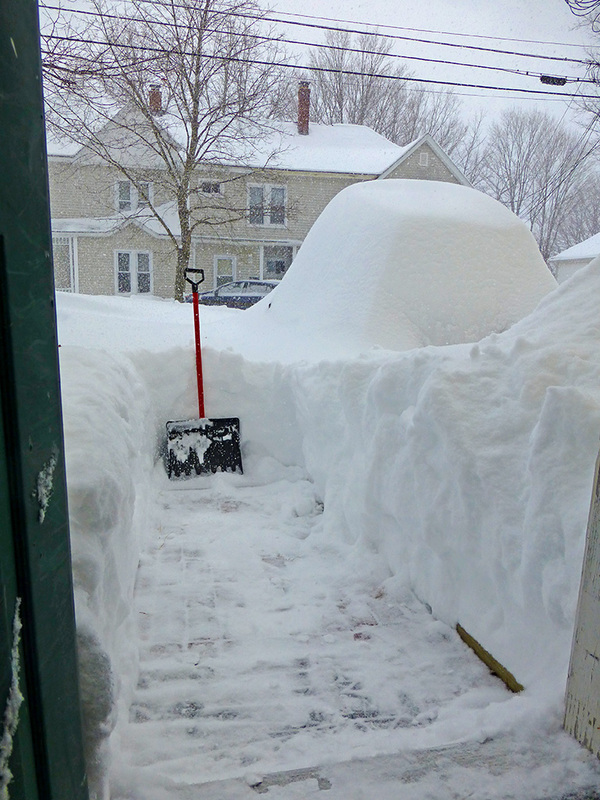 That big lump is my car, which is normally not much taller than the shovel. 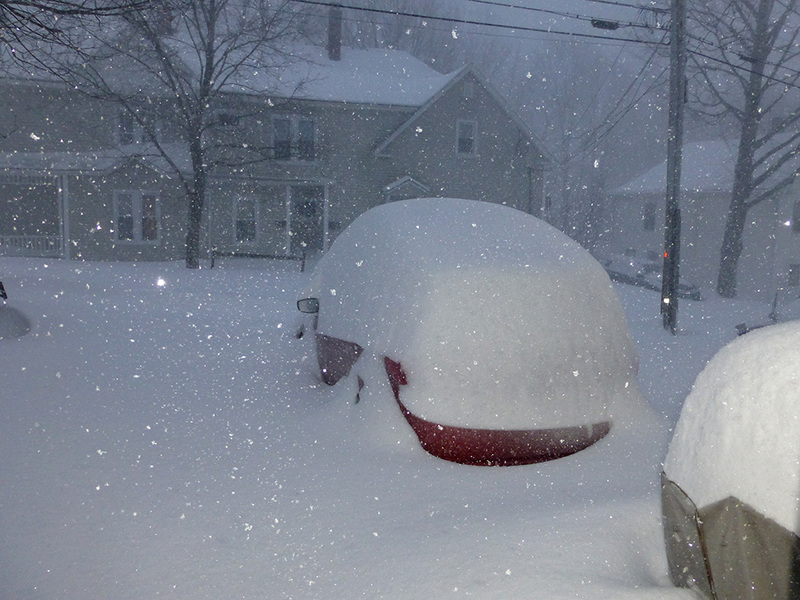 There may be yet another several inches of snow in store. It’s possible the sky is broken. 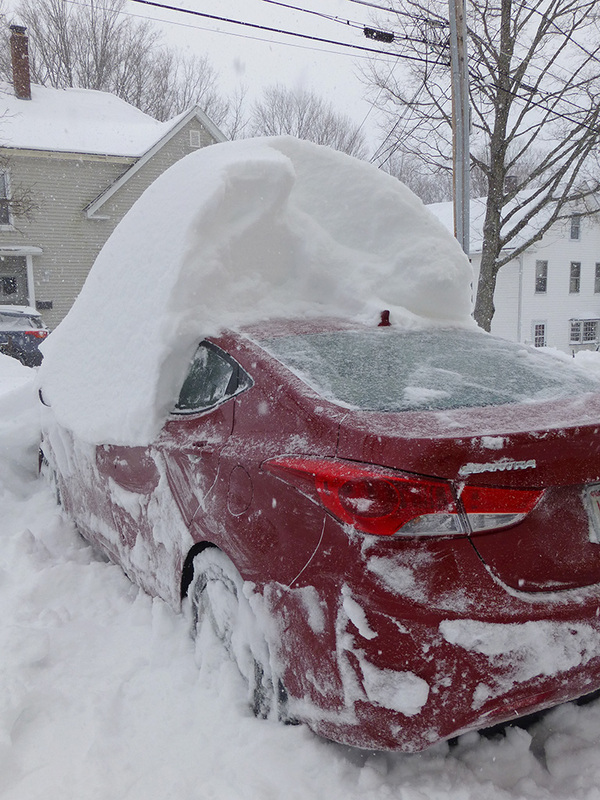 This entry was posted in Weather and tagged Blizzard of 2015. Oh, but are your city’s finest plow drivers closing off the end of your driveway with *yet* another 24 inches of snow? I swear to God, the ones in Portsmouth were avoiding my street until after the husband and I dug both our cars out from under. 15 minutes after we’d exhausted ourselves and gone inside, the street grader came by and obliterated any evidence we’d made an effort. The town has avoided such embarrassment by mostly avoiding my street altogether, though adjacent streets are down to pavement this morning. The worst part of the storm for me was watching the local news. The banter, the vapidness, the adverts…they burn my eyes, my ears, my soul. Have you seen the send-up that Jon Stewart did a few nights ago about the storm coverage in New York? I present the blizzapocalypsegeddon ’15! Balm for those pained eyes, ears and soul. I hope you are managing to stay safe and warm, Sir or Madam ! My driveway is also steep and hard to access when it snows. Luckily it has never snowed here. hahaha. Laughing at Keefies snowless humor. Yes we aren’t seeing any snow here either. Oh it falls a bit here and there every so often but never “sticks” and has disappeared in less time than you can make a cup of coffee. Glad you had soup and other warm stuffs at the ready Lalo!